Buffalo (Bison bison) also commonly known as the American buffalo, is a North American species of bison that once roamed the grasslands of North America in massive herds. They are herbivores, grazing on the grasses and sedges of the North American prairies. They became nearly extinct by a combination of commercial hunting and slaughter in the 19th century and introduction of bovine diseases from domestic cattle, and have made a recent resurgence largely restricted to a few national parks and reserves. 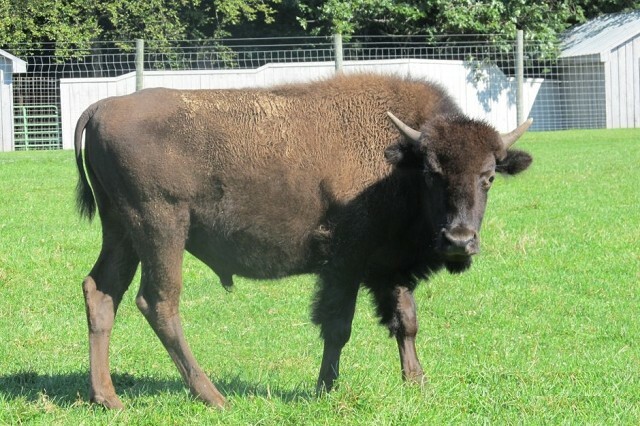 A bison has a shaggy, long, dark-brown winter coat, and a lighter-weight, lighter-brown summer coat. As is typical in ungulates, the male bison is slightly larger than the female and, in some cases, can be considerably heavier. Plains bison are often in the smaller range of sizes, and wood bison in the larger range. When raised in captivity and farmed for meat, the bison can grow unnaturally heavy and the largest semidomestic bison weighed 1,724 kg (3,801 lb). The heads and forequarters are massive, and both sexes have short, curved horns that can grow up to 2 ft (61 cm) long, which they use in fighting for status within the herd and for defense.